Gratz, Roberta Brandes. 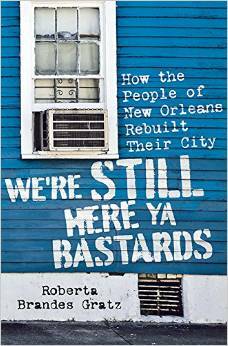 “We’re Still Here Ya Bastards: How the People of New Orleans Rebuilt Their City”, Nation Books, 2015.
strength and resilience of a community that continues to work to rebuild New Orleans and in doing so is revealed what Katrina was not able to and did not destroy: “the vibrant culture, epic history, and unwavering pride of one of the greatest cities in America”. The book shows us the most shameful machinations of city government. We learn what really was responsible for the closing of the hospital and how neighborhood residents were railroaded. We also read of citizens who are fighting the problems alone. There has been so many mistakes made and there has been so much neglect and apathy in the city, it is a wonder that anything is getting done but surprisingly it is. I was born and raised in New Orleans and I will always be a New Orleanian regardless of where I live and I have not lived there in many years. It hurts when someone has nasty things to say about New Orleans and the fact that so much went wrong that an American city was almost washed right off the map. This book is an investigation and reportage of a city in trouble and it is a wonderful tribute to a wonderful city. We read of the ugly, the good and the bad and even though I found some historical mistakes as well as information that has since been contradicted by Congressional testimony, it is still a fascinating read. It would have been that much better if the dates were correct, I love the stories we have not heard before and I love seeing that the citizens really care about bringing the city back, It is just not the place I want to be at this point in my life yet I still love my hometown. It is possible to love a place and not live there. It hurts to see New Orleans today because it does jive with the memories I have. We really have had so much written about Katrina that I am not sure that we need any more but in the case of this book, it provides what others have been not so fortunate in doing. Gratz writes about education, healthcare, urban development and environmental preservation and does so from the voices of the people. She shows us how the people of New Orleans are rebuilding their city. Those New Orleanians who are saving their city while big money and bad government try to do the opposite. This entry was posted in Hurricane Katrina on August 14, 2015 by Amos.